A concept interior design of a tapas bar in central Sofia. The tapas bar is a transformation of a small café, a shop and a former janitor's room on the ground floor of an old building from the year 1938. 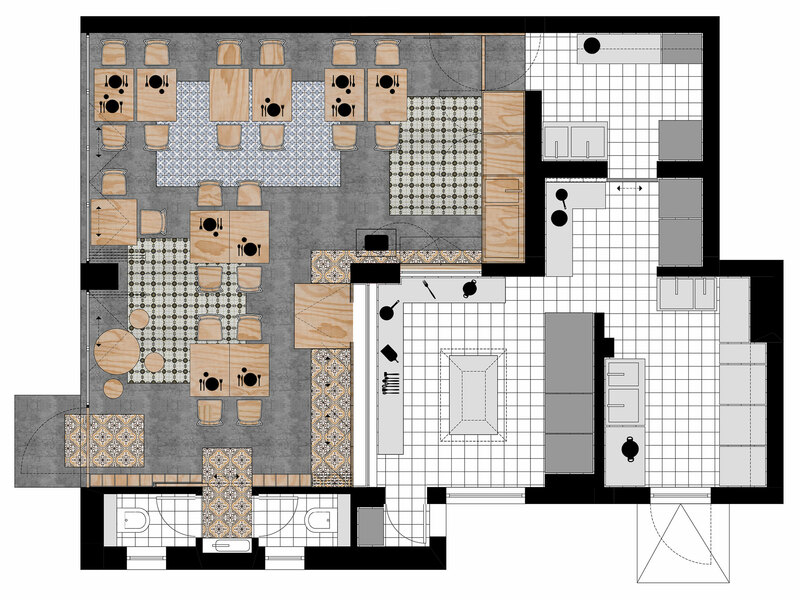 The demolishing of the wall between the shop and the café and the creation of openings in two other walls combined with the necessary reinforcement of the load-bearing structure lead to the final layout with a dining hall for 25 customers and open kitchen with show-cooking. The flooring in the dining hall combines polished concrete with colourful cement tiles which continue onto some parts of the walls. The ceiling is stripped down to the concrete slab, leaving the cables for the lighting exposed. The furniture in the dining hall combines natural coloured oak wood and plywood with black metal elements. The walls are painted grey as are the decorative gypsum ornaments covering the largest wall behind the tables. By entering, the view is instantly drawn to the kitchen area - brighly lit and covered in white square tiles, with fresh green herbs growing in front of the cooking counter.